My Story Recommendation of the Week is for Discarded by my friend Miranda Suri, from the November 2013 issue of the webzine Electric Spec. 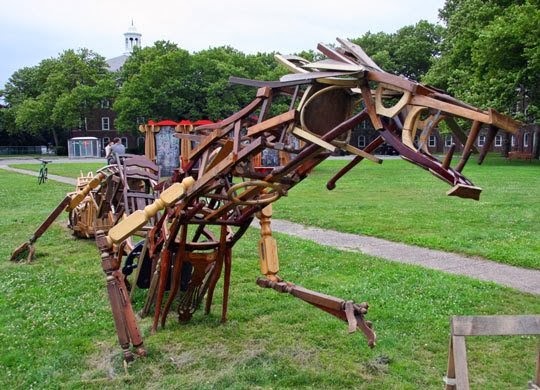 A dragon lives on Governors Island. He is made out of chair legs, bits of discarded furniture, and afterthoughts. His eyes are the negative space left by splintered pieces of scrollwork from a banister, his scales the sawed-off ends of two-by-fours. By day he sits on display in an outdoor art installation. Cut grass feathers his legs and his faded paint peels. He drowses in the late summer sun while weekend visitors from New York snap his picture and peer at the little plaque by his feet. It amuses him that they believe he is only a piece of art. Suri's story was inspired by an actual sculpture on Governors Island (pictured above). In the story "Discarded," the dragon is both a work of art and an artist himself. The dragon watches as a fugitive arrives on Governors Island and contemplates what's missing from his own artwork. "Discarded" is a beautifully written story, and a thought-provoking commentary on the artistic process, one that doesn't necessarily flatter creative people the way literature typically does. I recommend it highly. Miranda Suri holds a PhD in Anthropology and has published extensively on her archeological research. Her fiction has appeared previously at Electric Spec and at Every Day Fiction. I've turned over the next bracket of the Battle of the Books to Amy, which gives me time to do some other posts, starting with a few story recommendations. My first Story Recommendation of the Week in far too long is for "This Quiet Dust" by Karl Bunker, from the January/February 2014 issue of Analog. One thing I generally find unsatisfying about alien stories (including my own) is that the aliens aren't truly alien. I suspect if we ever do encounter an alien intelligence, it will be so strange that we could easily fail to notice it's alive, let alone sentient. That's exactly what happens in "This Quiet Dust," in which an exploration vessel launched from Earth touches down on an alien planet, inhabited by an intelligence nearly too alien even to recognize. This is an Analog story, so the tale focuses on how the aliens work, with not a whole lot of time spent on the human characters. But Bunker's eccentric, poetry-quoting main character Henrick is likeable enough, and the way he irritates fellow crewmembers makes for entertaining reading. More importantly, Bunker's aliens are fascinating, and their interactions with Henrick, both onstage and implied offstage, are very nicely handled in such a short piece. Karl Bunker is a fellow Writers of the Future winner (Vol. 23), and has since appeared in Asimov's, F&SF, and Interzone. When you can sell to each of the top print magazines in the field, you're clearly doing something right. 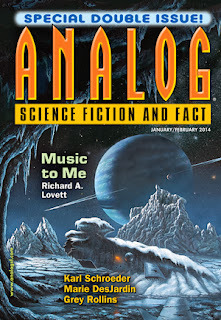 Incidentally, the January/February 2014 issue of Analog is a solid one, containing strong work by my friend Marie DesJardin, Thoraiya Dyer, Christie Yant, Richard A. Lovett, and others. It seems editor Trevor Quachri is doing an able job taking over for Stanley Schmidt. We have completed Bracket Six of the Fantastic Reviews Battle of the Books. There were good matches along the way, involving a number of books worth reading. Hope you had a good time and heard about about some new books and authors! Congratulations to Caliban's War by James S. A. Corey (aka Daniel Abraham & Ty Franck), winner of Bracket Six of the Battle of the Books! Let's give a round of applause for all the participating books! Some of these books and authors may be new to you, but after reading Aaron's book descriptions and battle reviews, I hope some of them sparked your interest. Perhaps we introduced you to a few new books. Only one book can win each battle, and only one book can win the bracket, but there were many good books in the competition. Stay tuned for Bracket Seven of Battle of the Books. We have another sixteen books lined up for the next competition. Aaron is taking a break from Battle of the Books. I, Amy, will be judging and reviewing Bracket Seven. We'll be announcing the new group of contenders soon. We have arrived at the championship of Bracket Six of the Fantastic Reviews Battle of the Books. 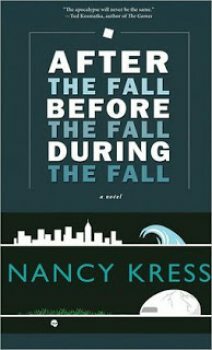 In one corner we have After the Fall, Before the Fall, During the Fall by Nancy Kress. 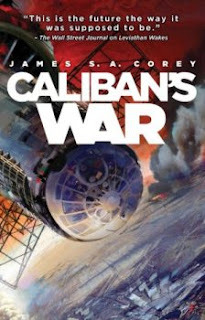 In the other corner we have Caliban's War by James S. A. Corey. After the Fall, Before the Fall, During the Fall: Tachyon trade paperback, April 2012, 183 pages, cover design by Elizabeth Story. After the Fall, Before the Fall, During the Fall won this year's Nebula and Locus Awards for best novella and was nominated for the Hugo. It reached the Battle of the Books championship round by knocking off The Skybound Sea by Sam Sykes, Pazuzu's Girl by Rachel Coles, and Earth Unaware by Orson Scott Card & Aaron Johnston. After the Fall, Before the Fall, During the Fall is a pre-/post-apocalyptic novel, with scenes alternating between the present day, the very near future as ecocatastrophe strikes, and in a ruined future a generation from now. In the present day, mathematician and new single mother Julie Kahn attempts to determine the pattern behind a series of strange child abductions, while simultaneously becoming alarmed by environmental research she has come across. In the year 2035, the last few surviving humans scratch out a life in an enclosed habitat, using a time machine provided to them by unseen aliens to obtain supplies and reinforcements from the past. In their cramped home, interpersonal tensions are reaching a boiling point, and our main character Pete desperately seeks some avenue of escape. Caliban's War: Orbit trade paperback, July 2012, 595 pages, cover art by Daniel Dociu. James S.A. Corey is the joint pseudonym of Daniel Abraham & Ty Franck. Caliban's War is the second volume of their Expanse series; the first book, Leviathan Wakes, was a Hugo nominee. Caliban's War got here by defeating Blood of the City by Robin D. Laws, London Eye by Tim Lebbon, and Be My Enemy by Ian McDonald. In Caliban's War, a bizarre creature has attacked Ganymede. Everyone suspects the creature is related somehow to the alien intelligence that wreaked havoc in Leviathan's Wake before settling on Venus. Jim Holden, a spaceship captain who was a main character of Leviathan's Wake, is sent to Ganymede to investigate, where he joins forces with Prax, a researcher on Ganymede desperate to find his daughter, who was abducted the day of the attack. Meanwhile, Bobbie Draper, a spunky soldier who survived the Ganymede attack, meets up with Chrisjen Avasarala, assistant to the undersecretary of executive administration on Earth, who pretty much runs the whole Earth governmentan from that position. The Battle: Usually I judge the championship round by reading both books to page 200, and deciding which book I most want to read to the end. We have to modify that for this battle, since After the Fall, Before the Fall, During the Fall is only 183 pages long. Exercising my judge's discretion, I decided to read to page 150 of that one, while still reading to page 200 of Caliban's War. That means I've read more pages of Caliban's War, but a greater percentage of the story of After the Fall, Before the Fall, During the Fall, so hopefully that evens out and makes for a fair contest. The first thing to be clear about is these are both very strong, wonderfully written stories. They are entertaining and thought-provoking, and I recommend both books. But I have to choose one as our Bracket Six champion. So I'm going to manage to find fault with one of them, but it doesn't change the fact that they are both very fine works. The Battle of the Books makes for an awfully demanding format. To win a bracket, not only does a book need to be very well written, but it has to succeed in building the reader's interest through multiple sections. You need a good opening 25 pages to win in the first round, then to follow the opening scene up with something interesting through the first 50 pages to win in the second round, and then keep building tension through 100 pages to make it through the semifinals. Finally, to win the championship, the section after page 100 has to continue to develop the story, so that the reader can sense interesting turns and a strong climax to the story on the way. As much as I'm enjoying After the Fall, Before the Fall, During the Fall, for me the section after page 100 has not done much to build my interest. In the present day, Julie has gone into hiding, believing herself in danger from some conspiracy to conceal the coming ecological catastrophe. She may be right, but I don't much care. We already know the world is going to end in a matter of months, so whatever short-lived conspiracy may exist seems irrelevant to me. In the future, the story has settled into Pete and a former rival foolishly obsessing about finding and killing the alien beings who provided the habitat and time machine that keep them alive. They're obviously in no position to do any real damage, so this also feels a bit pointless. After the Fall, Before the Fall, During the Fall is still a wonderfully done story overall, but the Battle of the Books is about more than whether the story succeeds "overall." In contrast, between pages 100 and 200, Daniel Abraham and Ty Franck have managed to continue to build interest in the story. For one thing, they paired up their viewpoint characters in a way that really works, at least for me. I wasn't especially interested in Prax's search for his daughter, but it intrigued me when Prax and Holden met up, and now I want to see where their joint investigation will lead them. Similarly, Bobbie is a great character but I wasn't sure what role she would play in the main narrative. But now that she has gotten together with Avasarala, we can see that she will continue to be in the middle of the action, which makes me want to keep reading. The authors include plenty of action, but vary it nicely. For instance, Holden and Prax get into a gun battle in one scene, but in another scene they avoid a gun battle by a clever impromptu negotiation. And the characters continue to develop in interesting ways, particularly some of the side characters. For example, Holden's crew member Amos had previously come across as easy-going, but between pages 100 and 200 of Caliban's War we get more glimpses of his complete personality, notably some bottled-up rage that comes to the surface unexpectedly. Even though I really like After the Fall, Before the Fall, During the Fall, after 150 pages it wouldn't be quite so difficult to put down as it would have been after 25 pages or 50 or 100. Whereas after 200 pages, I want to keep reading Caliban's War more than ever. Caliban's War wins Bracket Six of the Fantastic Reviews Battle of the Books. Congratulations to Daniel Abraham and Ty Franck, who join Elizabeth Bear, James Renner, Paolo Bacigalupi, Ian Tregillis, and Keith Brooke as Battle of the Books champions. I'll now hand the Battle of the Books over to Amy to judge Bracket Number Seven. Stay tuned for a whole new set of battles to come!